0 Comments Posted by islandtreesadmin in Pet Health on Thursday, December 15th, 2016. Holiday season adornments are attractive to all creatures. The ornaments, foods, gifts, wrappings, ribbons, lights and plants are all curiosities for pets. Pets investigate new items by sniffing, tossing, chasing and finally by tasting. A few precautions are necessary to avoid the holiday crowds at the veterinary hospital. The most common problems this time of year are stomach or intestinal disturbances caused by pets eating the holiday feast or other novelties. Scraps from the table can cause gastrointestinal upset and even predispose pets to life-threatening pancreatitis. Bones can get stuck in the mouth or perforate the intestines and should be avoided. Chocolate is poisonous to cats, dogs and birds. Plastic wrap and aluminum foil (coated with good-tasting juices) are enticing but can cause intestinal damage and even blockage if eaten by your pet. Other sweet treats like gum and hard candies can also make your pet ill. Sugar-free candies and gum are made with xylitol, a sugar substitute that can cause a drop in blood sugar, depression, loss of coordination and seizures in your pet. Xylitol is also linked to liver failure in dogs. Be sure to keep all candies, chocolate and other sweets out of your pet’s reach. If you believe your pet may have ingested chocolate or candy, call your veterinarian immediately. Be sure to properly dispose of leftovers and wrappers. Feed pets their usual diet. Treats formulated similarly to the pet’s regular diet are generally healthy and safe. Also keep in mind while cooking that pets may not know about hot stoves or to stay out from underfoot. Keep pets away from the stove so they don’t get burned or have hot foods spilled on them. Several decorative plants are poisonous. Mistletoe and holly can cause stomach upset with vomiting and diarrhea. The berries of these plants are attractive, easily swallowed and potentially fatal if consumed. Poinsettias, like the leaves of most any plant, can also cause stomach upset. Use artificial mistletoe and holly, and keep other plants out of your pet’s reach. Make sure Christmas trees are secured so pets can’t pull them over. Omit preservatives from the tree-stand water and cover the tree well so pets don’t drink from it. Don’t spray fake snow on the tree unless it is labeled safe for pet consumption. Angel hair is spun glass and is irritating to both the inside and outside of your pet. Even glass ornaments and ornament hooks have been chewed and swallowed. These objects can cause problems from stomach upset to damaged intestines. Low-hanging ornaments are a real temptation, as are tinsel and electric lights. 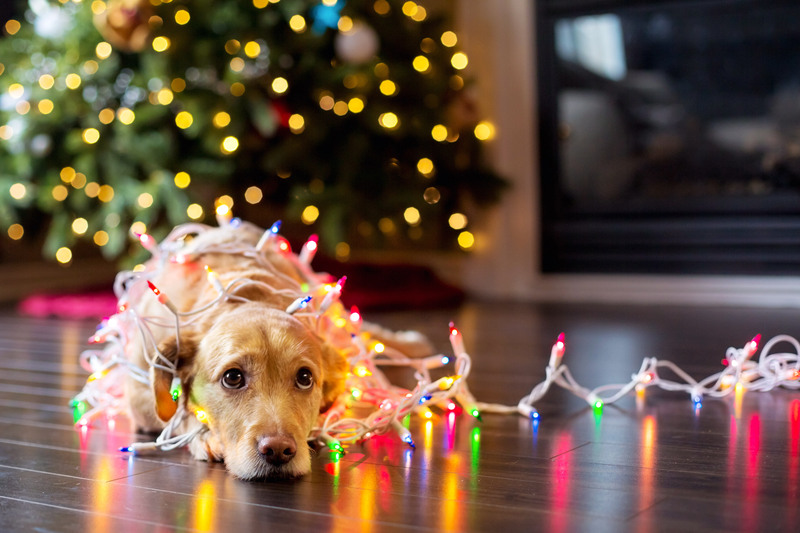 Decorative lights and electrical wiring can cause shock or burns when chewed, so remember to unplug holiday lights when pets are left unattended. Holidays have lots of activity. Be sure doors are not left open as guests come and go. Indoor pets inadvertently left outside could be injured by frostbite, cars or other animals. Ice-melting chemicals and salt on sidewalks and roads can severely burn foot pads and should be washed off right away. Also, watch that guests don’t leave interesting objects such as chocolate, ribbons, stocking stuffers or other illicit treats, within your pet’s reach. If your pet does get sick, consult your veterinarian before giving any medications. Many of the over-the-counter drugs such as acetaminophen (Tylenol, Excedrin and ibuprofin), Advil and Motrin, are toxic for animals even though they are safe for us. Don’t wait to see if your pet gets better. If your pet is acting sick, consult your veterinarian immediately.